Fitness Equipment Market size was valued at over USD 10 billion in 2017 and will grow at a CAGR of 4% from 2018 to 2024. Rapid change in the consumer lifestyle due to busy working schedules and unhealthy food consumption drives the fitness equipment market growth. Transition in the living habits across the globe is leading to an increase in the rate of chronic diseases and obesity, further creating the need for exercise and fitness among youngsters. Additionally, supportive government initiatives in several countries spread fitness related awareness among the population contribute to the industry growth. For instance, the U.S. Department of Health and Human Services launched a physical activity initiative for children that ensures better health and improves students’ performances. 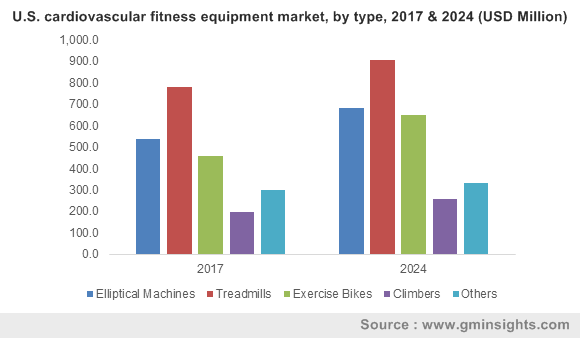 The development of wearable technology and incorporation of smart devices in fitness machines and gyms is boosting the fitness equipment market demand. Connected devices, such as activity trackers & smart watches, track the consumers’ performance and actual exercise timings. Moreover, the development of smart gyms and increasing consumption of household fitness machines add up to the high demand. Several manufacturers have launched smart exercising machines, such as Bluetooth dumbbells & connected rowing machines, to enhance the consumer experiences. For instance, Peloton introduced its home cardio bike that comprises a 22-inch touch screen display and supports the iOS application for tracking the performance. Unawareness about the advantages of these machines among the rural population across various developing countries is hindering the fitness equipment market growth. Moreover, high costs associated with the modern exercise machinery due to the technical advancements impacts the industry demand across the globe. The cardiovascular fitness equipment market is predicted to reach over USD 8.5 billion by 2024. Rising number of gyms and health clubs across the globe are generating a huge demand for the machines. The trend of bodybuilding and personality development among the young population results in increasing gym subscriptions and further increases the consumption of cardiovascular machines such as treadmills, spin bikes, and others. Additionally, increase in consumer spending capabilities for setting up home and personalised gyms has generated the demand for cardiovascular market. Growing impact of obesity and health problems among the working segment in developed countries creates the need for exercising regularly. These factors along with the development of smart treadmills support the industry growth. Growth in the consumption of body toning products mainly among the young population is predicted to anticipate the demand for strength training machines in the fitness equipment market. These products are deployed in gyms and health centers that provide personal weight lifting and body building training. A shift toward modelling and fitness training profession further contributes to the consumption of these machines. A long product life and benefits, such as efficient contribution in toning the body parts, generate a high popularity of strength training equipment. Weightlifting and extension machines are expected to cover a major share in market over the forecast years. In the fitness equipment market, the office segment is anticipated to grow at a CAGR of 5%. This growth is attributed to employee-centric strategies adopted by the corporate sector. Organisations offer several health policies and fitness packages to employees for creating a healthy organisational structure. Companies also provide benefits, such as in-office gyms, that allow the employees to exercise within the company premises and aid in time & money saving. Major organisations across the globe are offering employee wellness programs that further add up to the market growth. For instance, Chesapeake Energy Corp. developed a 72,000 square foot fitness centre for the employees with access to several personal trainers. The hotel fitness equipment market was valued over USD 580 million in 2017 is expected to witness a rapid growth due to the need for better hospitality services and facilities that they provide to their customers. Developments in fitness centers of hotel to provide a high-value and enhanced staying experience is adding up to the consumption of these machines in hotel infrastructures. Major hotel chains across the globe such as Marriott, Four Seasons, and others. have developed in-house gyms in their premium suites that incorporate basic machines such as treadmills, weights, and bikes. Additionally, growth of the tourism industry worldwide adds up to developments in hotel fitness and health clubs, further boosting the market demand. The U.S. fitness equipment market has dominated the industry with a market share of over 35% in 2017 due to the presence of a technically-sound and fitness-aware population. Rapid urbanization and technical developments in the region are leading to the establishment of health clubs and home gyms. Furthermore, the rising health-related issues due to increased pollution levels creates the need for fitness among citizens. To tackle the impact of pollution and eliminate health problems, the U.S. government has initiated several physical fitness & health awareness programs. Additionally, supportive provisions, such as low interest loans, for health clubs and fitness centers is generating the market growth. The Asia Pacific fitness market is expected to grow at a rapid pace owing to developments in healthcare and fitness sectors in countries including India and China, among others. Changing consumer lifestyle due to industrialisation and penetration of the service sector in the developing countries is driving the industry growth. Moreover, the rise in discounts & offers provided on gym memberships enables increasing gym subscriptions that further create opportunities for the fitness equipment market growth. 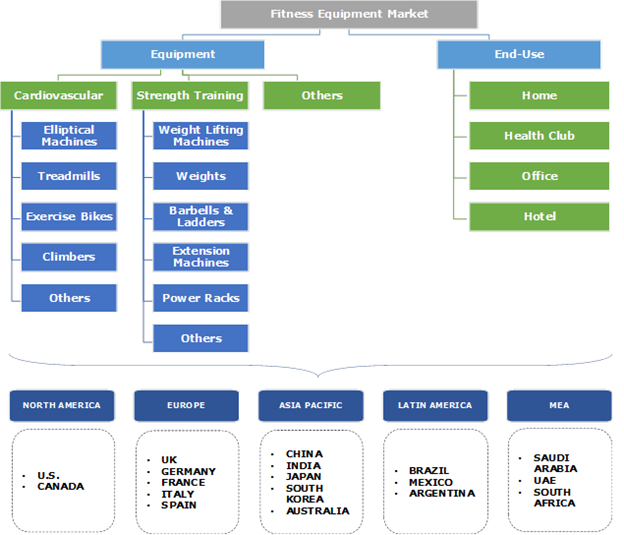 Prominent players operating in the fitness equipment market include Johnson Health Tech, Amer Sports, Icon Health & Fitness, Technogym S.p.A., Brunswick Corporation, Torque Fitness, Nautilus, Inc., and True Fitness. The major companies are focused on developing high-quality and smart fitness machines. To address the needs of consumers that include the demand for technically-advanced and connect gym machinery, companies have adopted product innovation strategies. Moreover, companies are incorporating merger and acquisition strategies that aid them in enhancing the product portfolio and creating a strong regional presence. For instance, in August 2018, ICON Health & Fitness announced its agreement with VF Corporation for the purchase of Altra, a footwear brand. Technical advancements and popularity of the connected exercise machines drives the fitness equipment market demand. The industry comprises few manufacturers operating globally that offer the cardiovascular and strength training machines. These players focus on developing partnerships and contracts with health club & hotel chains, top organizations, and government agencies for supplying high-quality machines. These strategies aid the companies to gain a competitive advantage and support health awareness initiatives across the globe. The industry players manufacture most of the equipment on a build-to-order basis and by considering the projected sales. The product portfolio includes cardiovascular equipment, free weight & resistance equipment, weight benches, and weight stands.